I have had a pretty busy couple of weeks. I have been to an different state every week since the start of the elections here and I am really tired. 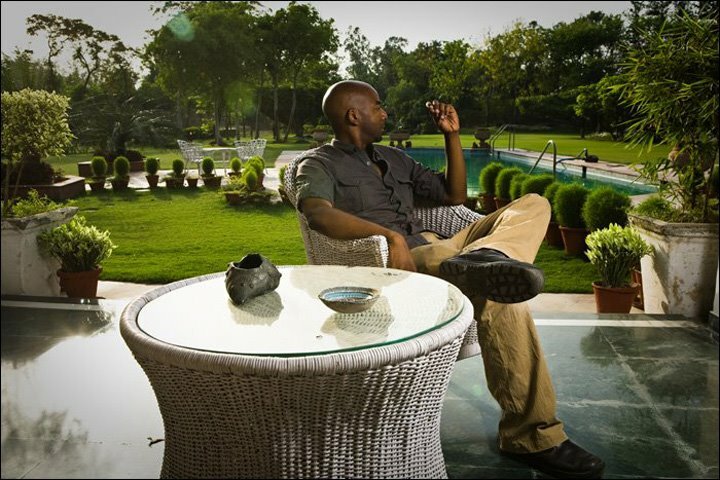 A few days ago I helped my friend Sanjit light portrait of a CEO for a matrimonial website where this picture was taken. I look like such a man of leisure lounging on his estate in this picture. The sad part is it only reminded me of how tired I am. Since I don't have an estate of my own with a pool to lounge by I did the next best thing an exhausted photojournalist could do. I took the day off. Keep in mind it is 110(f) here. II went to the pool, took a swimming class, flirted with a pretty blonde, grocery shopped for a dinner party, and had several beers and dinner with Sanjit and Suzanne.I pretty much fucked off the entire day. No archiving, no editing, no shooting, no research, just an day off. After weeks of politicians, rock throwing, flash bangs and tear gas, writing, archiving, researching, shooting, early mornings, and late nights, I think I earned a little break. Tomorrow I am back to work. Today can be my Sunday.